Bike Walk Lincoln Park: Join the inaugural Lincoln Park Kidical Mass on July 14th! Join the inaugural Lincoln Park Kidical Mass on July 14th! 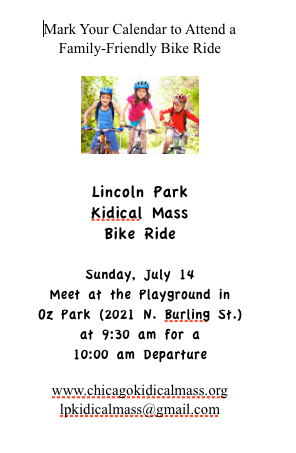 The first Lincoln Park Kidical Mass bike ride will be held on Sunday, July 14, 2013, and we hope you'll join us! Kidical Mass is a nationwide movement of people organizing family events to encourage parents and children to ride bikes. There are already organized monthly rides in Logan Square, Hyde Park, and Lincoln Square, and you can get information and see a video on the Chicago Kidical Mass website or check out the photos on the Kidical Mass Chicago Facebook page. The rides are slow-paced and designed to allow children of all ages to participate. Kids can be on their own bikes, or riding along in a trailer, on a seat on their caregiver's bike, or any other bike-related means of conveyance. We're helping to bring this event to Lincoln Park through the vision of Bike Walk Lincoln Park supporter and Lincoln Park mom Lacey Cordero. We'll meet up in the Oz Park playground starting at 9:30 am, and plan for a 10:00 am departure. We'll take quiet side streets and have extra adults on hand to help keep everyone together! If you have questions, please e-mail Lacey at lpkidicalmass at gmail dot com or post them below. See you on Sunday at Oz Park! We welcome anyone who wants to help make biking and walking in the Lincoln Park neighborhood safe and enjoyable to contact us, and join in on events! Co-leaders are Michelle Stenzel and Michael Reynolds. Improved crosswalk installed on Stockton! Successful first Lincoln Park Kidical Mass!